Ain't nothing like bad granola and 4:30 a.m. pen show travel. As a bit of a last minute present to myself after having to miss LA for a work conflict, I get to take a trip to the BWI pen show this week! If you're going to be there, let me know. In the meantime, this week's Deals and Drops includes a lot of pens that I'll be looking for this weekend! Aurora 88 Anniversary w/ New Flex Nib (via Pen Chalet). 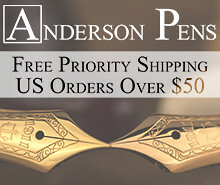 I'm absolutely stoked to get my hands on this pen. I should be taking home a review unit to put through the paces. 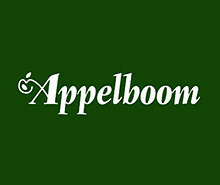 Look for my thoughts up on the blog over the next week or so. Franklin-Christoph Sweet Maroon Ink (via Franklin-Christoph). You may have seen pictures of this ink all over Instagram. I love Burgundy/Maroon inks (high school colors and all), so I'll probably be picking up a bottle of this along with the Urushi Red. I wonder if they'll have another show special like their orange ink from Philadelphia? 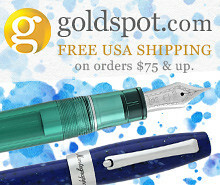 Goldspot Pens Clearance (via Goldspot). 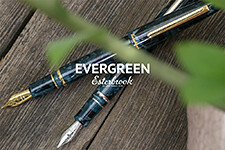 Goldspot is currently running a Spring clearance sale with a lot of nice discounts on brands like Monteverde, Cross, Sheaffer, and Private Reserve. Mark Twain Conklin Limited Edition Crescent Filler Demonstrator (via Pen Chalet). Ron has these in stock in both the blue, red, and clear with rose gold trim. He sent me a red demonstrator to test out and review, and I'll be posting a review. 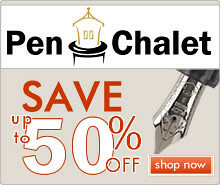 The price on this pen is great at 50% off, and the stub nib I tried was a smooth and reliable writer. The regular Crescent Filler (non-demonstrator) is on sale for under $100. Pilot Ageless Present Collection Ballpoint (via Pen Chalet). I've heard good things. Pilot Stanza Collection Ballpoint (via Pen Chalet). Sailor Fresca Blue Special Edition (via Anderson Pens). Apparently the "North American Exclusive" is going to be a new thing with Sailor, and this is high on my list of things to check out this weekend. Who knows, there's a good chance I may come home with one! Pelikan M101N Bright Red (via Pen Chalet). 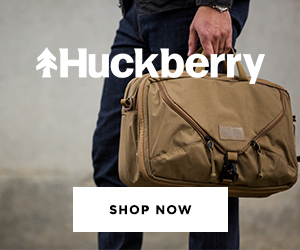 The latest in the vintage-inspired M101N series is available for pre-order now. I've been looking to add one of these to my collection for a while. I hope someone has one this weekend because I'm torn between this and the Red Tortoise (see below). Pelikan M101N Red Tortoise (via Amazon). Another former limited edition that I've had my eye on for a while, though they're becoming more difficult to find from retailers. Pelikan M101N Lizard (via Amazon). A nice looking M101N from a few years back, if you're not into red pens. TWSBI 580 (via Amazon). OK, it's embarrassing for me to admit that I don't currently have a TWSBI in my collection. I end up selling them off or giving them away to people interested in getting into the hobby, and I always end up regretting it. I may also try to pick up one of these Clear TWSBI Eco's. Caran D'Ache Leman Fountain Pen (via Pen Chalet). 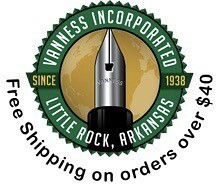 Ron is now carrying Caran D'Ache pens, and has the very high-end Leman on special. I've always been partial to the aesthetics of the Ecridor, and want to see if I can locate one this weekend. Montblanc Ultra Black Classique (via Anderson Pens). I've been thinking of adding a MB Classique fountain pen to the arsenal, and if I did I'd go with the Ultra Black. I already own a Classique ballpoint which I love. Pilot Metropolitan Retro Pop with 1.0mm Stub Nib (via Anderson Pens). I hope the Andersons have a tester, because this is one that I want to try in person before I buy. Wipebook Pro Whiteboard Notebook (via Massdrop). I have something similar and use it all the time. This looks nicely executed. 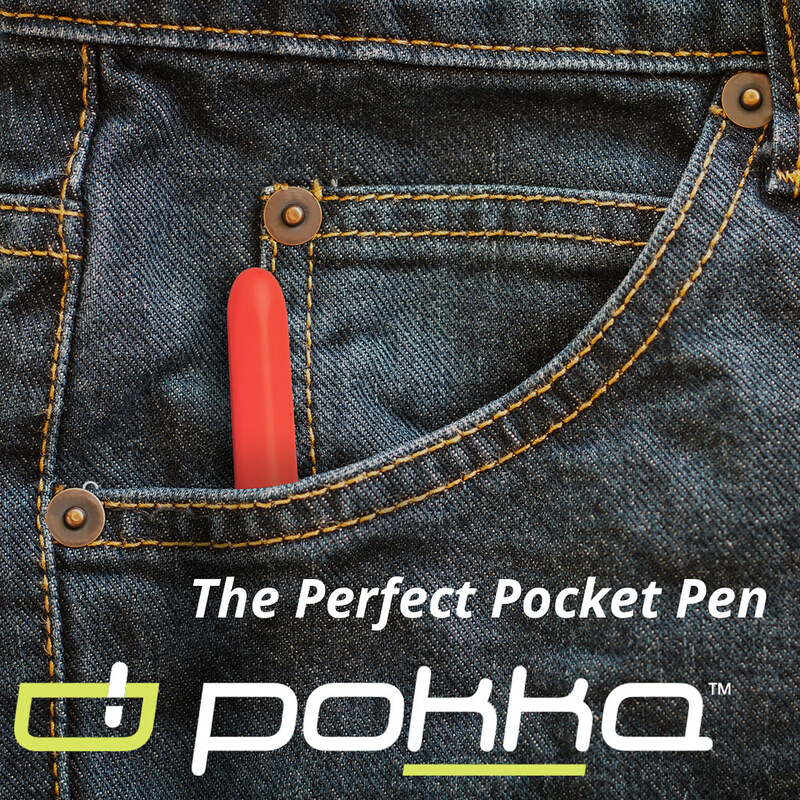 Wink Pen (via Massdrop). The Wink Pen is back on Massdrop, though I've heard mixed reviews on functionality.